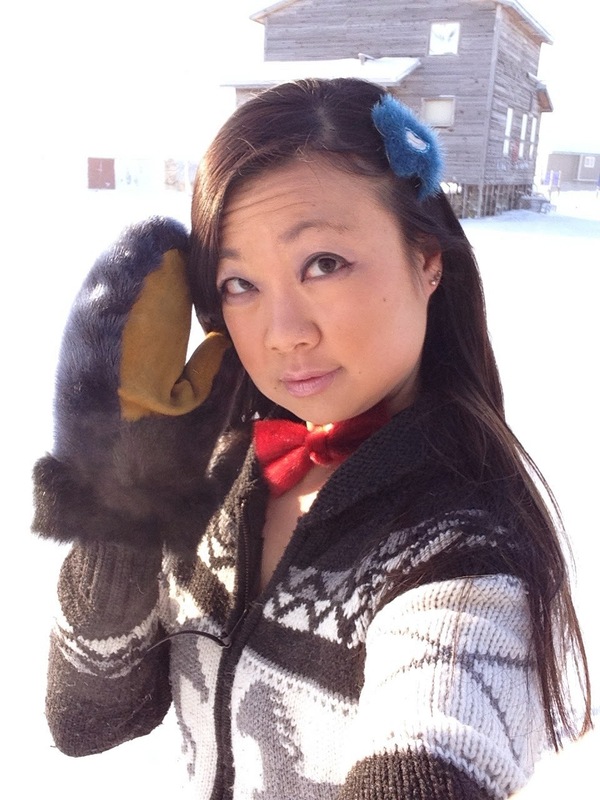 Here's my #sealfie to support the Inuit hunters who feed their communities with the game they catch, including seal, as well as the skilled artists who make beautiful (and very warm!) clothes and accessories with the fur. For the record, it was -51 degrees with the windchill outside when I took this photo. I almost got frostbite again in the few minutes I stood outside! Well, as you can read in this CBC article, Ellen Degeneres caused an uproar when her selfie at the Oscars became the most retweeted photo ever. The company Samsung offered to donate millions of dollars to a charity of her choice, and Ellen chose the Humane Society of the United States, which is against seal hunting. She then put out a statement on her website calling seal hunting "one of the most atrocious and inhumane acts against animals allowed by any government." The statement stung many Inuit folks, who have depended on the hunt to live for centuries. One woman, Alethea, wrote an in-depth statement which you can read here. A bunch of people in Nunavut have responded by posting "sealfies", photos of themselves wearing sealskin, on Twitter. look at more sealfies here! It's particularly timely when you consider the report recently released confirming that people in Nunavut have the highest food insecurity rate for any indigenous population in a developed country at 68 per cent. The CBC article reporting on it also noted that 76 per cent of Inuit preschoolers skip meals, while 60 per cent have gone a day without eating. Also, the average cost of groceries for a family of four in Nunavut is $19,760 per year while almost half of Inuit adults earn less than $20,000 annually. We've all seen people, even children, going hungry in town here. Being able to go out on the land and hunt country food has been one way that people have been able to survive. And finally: I hope you're still voting every day for my band Scary Bear Soundtrack for CBC Music's Searchlight contest for Canada's Best New Artist! Even if I haven't written a song about seal hunting. Yet. Springtime in Cambridge Bay: still frozen. So the vernal equinox has passed and all I hear from you people down south is are complaints that Ottawa and Toronto is still snowy and cold, and the cherry blossoms are blooming enough. Well, we've been getting beautiful spring days here in Cambridge Bay. What does spring mean in Cambridge Bay? It means that it's actually warm enough to snow. It's always exciting to look forward to spring blizzards. It means that it's only maybe -40 degrees outside with the windchill, which means the front door won't freeze, you don't have to warm up the car for a full hour before driving it, and you *might* be able to walk around outside without getting frostbite on your ears (I still keep do though, unfortunately). The biggest difference between winter and spring here, besides the mild weather, is the daylight. Glorious, glorious daylight, all day long. Right now we're getting some 13 hours of daylight. In less than two months, the sun is going to stop setting. 24 hours of daylight...and the ocean will still be frozen. This truly is a magical place. Sad inukshuk, or bowing inukshuk? And don't forget! This is your daily reminder to vote for my band Scary Bear Soundtrack and Avid Napper for our song The Longest Night in CBC Music's Searchlight Contest! So these Russian guys DROVE HERE from Russia. Just going for a drive. Behind the truck is the frozen Arctic Ocean. I am not making this up. They drove out of Sibera, over the frozen Arctic Ocean, right over the North Pole, and have now pulled into Cambridge Bay for a pit stop. They're going to keep driving through Nunavut, towards Alaska, and then heading back home to Mother Russia via the Bering Strait. Now that is a road trip. I wonder if they are going through customs. I got a good look at their vehicles. It's not like they decided to jump into their Honda Civic and go for an evening drive. These are serious tires that are more or less intertubes that can deal with the rough tundra and crazy ice. Behind them they were dragging a trailer of supplies. So, apparently I lied when I said Cambridge Bay is a fly-in only community. Never mess with the Russians. My friend's husband is an avid hunter and he caught a polar bear recently, about 40 miles east of town. 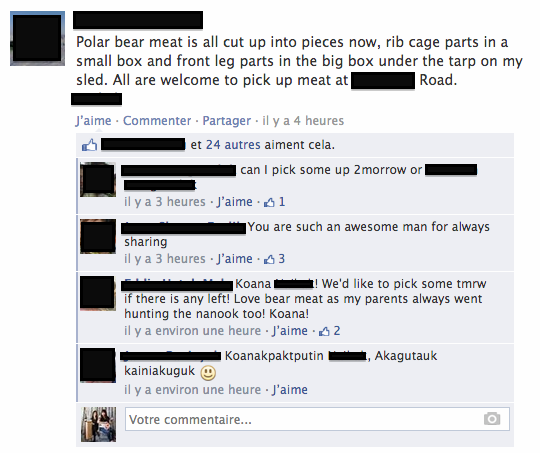 In true Ikaluktutiak spirit, he shared his kill with the entire community. Hunting polar bear is a very restricted, tightly controlled process in Nunavut. In order to hunt a polar bear, you have to first obtain a tag, which is not an easy process. Only a very limited number of tags are given out per year; if you are the next person on the list to get a tag, you have only a certain number of days to track and catch ONE polar bear. If you don't manage to get one during that time period, too bad. You have to give it back and it goes to the next guy. You need a separate permit to export the hide out of the country. Everyone in town was happy to get their hands on some tasty healthy country food, so we decided we'd give it a try too. I was curious about whether it would have a strong beary taste to it. We haven't eaten very many carnivores before. We dropped by the yard where the hunter G was storing the meat. Luckily, all of the outside world is one big freezer here, so he was keeping it wrapped in a tarp on a sled. While we watched, he pulled out a foreleg from under the tarp, set it on the snowy ground, and started hacking pieces off with a little axe, all while the huskies gathered around to watch. That was quite the process. Very different from our usual trip to the butcher's shop, where, you know, you walk up to the counter and say, "I'm feeling like a little lamb shoulder this evening' and the butcher cuts it precisely in a certain way. Getting a precise cut of meat is a bit more difficult to do when, you know, the whole bear has been completely frozen in -50 degree weather ever since it was shot. But after a bit of sweat and effort, we got our sample of polar bear meat and brought it home in a plastic shopping bag. It had been a five-year-old female, and there were still bits and tufts of white hair embedded in the meat. Rob got working on it right away. After thawing it out, he rinsed it with water for a long time, to flush out all the blood. He also used a good knife to cut away some of the fat...and you can imagine there was a lot of fat, since the polar bear has to keep warm in Arctic temperatures all the time. At one point, Rob found a piece of hip bone. I wanted to keep it, like a lucky charm, but Rob wouldn't let me, and he threw it out. Then Rob boiled it for a while, with salt and pepper and a pinch of vinegar. The boiling process let us watch all the impurities rise to the top, all the dirt, hair and fat. We pondered for a while what kind of dish to make with the polar bear meat. Some of our friends had turned it into a stew, which is always a safe bet because you can cook it for hours. There was a lengthy lengthy discussion about trichinosis. You know, that parasite disease you get from eating certain uncooked wild game, especially bear meat. So that ended my suggestion of serving polar bear sashimi. Eventually, Rob decided to cook the polar bear kalbi-style. You got that right. The delicious Korean barbecued beef ribs that every single person who has ever tried has immediately loved (*unless they were vegetarian). It's the most popular item at those all-you-can-eat Korean barbecue restaurants. You can't like it. So Rob went for it. Rob had spent the holidays last year being taught by my grandmother, my mother and my aunt on how to make the perfect kalbi. Every Korean family has their own varied recipe for making kalbi. My grandmother makes amazing kalbi. Unfortunately, my generation of girls in our family doesn't seem to have much of a knack for cooking, so my grandmother has passed on her own personal recipe to Rob. And Rob has been doing some pretty delicious and creative things with it. Rob made the marinade (which includes pear!) in the blender and then poured it over the boiled polar bear meat. Then he let it sit overnight. So how did it turn out? To be completely honest, I was expecting it to be an acquired taste; at best, not horrible. My logic was that it's a carnivore, full of tough muscles, so I couldn't see it tasting like veal. Not to mention, it's a polar bear. Weird things have got to taste weird, right? also, look at that flower carrot! I guess you just have to know what to do with it. And soaking it in delicious kalbi sauce, served with a regular Korean feast, is one way to make it taste amazing. I am not doing one of those fakely enthusiastic "it tasted very...interesting!" acts. I honestly could have eaten all night. I pigged out. Incidentally, there was a little bit of polar bear meat left over, so Rob brought them over to his colleagues. One of his colleagues, who is a woman from the Philippines, was very pensive while tasting it. "It tastes like...like something, I'm trying to remember," she said. Then she swallowed. "Oh, that's right. It tastes like dog! I like it." She smiled. That was the exact moment that Rob's other colleague, a woman from Newfoundland, had put the meat in her mouth. The look on her face when she heard "dog" was priceless. Hello blog readers! I was wondering if I could ask you for a favour and get you to vote for my band. My band Scary Bear Soundtrack has entered a contest being held by CBC Music. It's got some fancy prizes, and it's a great chance to let more people know about our music. For the contest, we've entered our song "the Longest Night". It's a song that I co-wrote and recorded with my friend Charles Lynch (also known as Avid Napper), mixed by North Bay producer Ben Leggett. The song title refers to the longest "night" in Cambridge Bay, which lasts for 6 weeks in the winter when the sun does not rise above the horizon. The song tells the story about two local hunters who got lost out on the tundra last year but were miraculously rescued after a few days. I've actually written about the tale on the blog here. Now you can hear it in form of a dance song! The Longest Night (feat. Avid Napper) by Scary Bear Soundtrack You can also download it for free from our bandcamp site. If you could do me a favour by voting for us, once every day, that would be wonderful! And if you can get your friends to vote for us every day too, that would be even more wonderful! We are pretty enthusiastic about this contest. CBC Radio 3 host Grant Lawrence has already personally chosen our song as an early standout and has said some kind words. We're hoping to make it as far as we possibly can...so if you can help us out by voting (and voting every day), you have my thanks in advance! I'm reading Cormac McCarthy's The Road while I travel across the Arctic and I know this is an obscene exaggeration but sometimes I feel like I'm traveling in the book with the characters. Yellowknife is an odd stop in the middle of the journey from Cambridge Bay to Iqaluit and back. It's warm. And there are trees. The flight attendant's hair is curled and she's wearing makeup like no woman in the north ever wears (we prefer the "permanently flushed and/or frostbitten" look). Yellowknife. Sometimes it feels like emerging on to the last refuge after wandering through a post-apocalyptic landscape. You stop for a drink at the Boston Pizza and peruse the aisles of the Shopper's Drug Mart. After months of shopping at the Northern and the Co-op, the Your Independent Grocer's seems surreal. Then back on to the plane. Less than half an hour outside of Yellowknife and there are already no more trees. Just slopes of silver that make up the frozen tundra. Lots of stops along the way. Rankin Inlet. Kugluktuk. Nothing to do there while you wait. I'm flying only a few days after that airplane from Malaysia mysteriously vanished into thin air. It worries me. I'm not a nervous flyer, although some people here are. I don't how they survive in the north, since you have to fly in and out all the time. But planes aren't supposed to just disappear, like an episode of Lost. Also, it's just a weird time to fly. 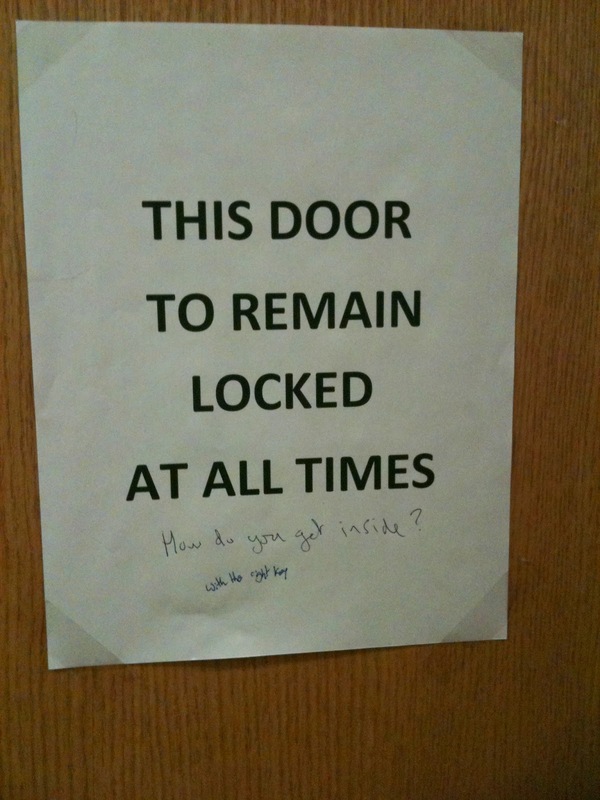 People have been behaving oddly lately. Around the same time that I was traveling, a woman snuck alcohol on to a plane, got drunk in the bathroom, and accosted a flight attendant before getting dragged off the plane by the RCMP. This, by the way, was on the Yellowknife-to-Cambridge Bay flight, the flight that we always take. The airports seem like a scene of hurried activity and confusion. I listen to airport security staff argue about whether a little girl is supposed to be boarding a plane on her own or not. Eventually they decide to pull heroff, and I watch the female staffer hold the girl's tiny hand as they walk across the hall, leaving her with a man we all assume and hope is her relative. One of the interesting things about northern travel is that the airports don't screen passengers through security before they board a plane, which is, I suppose, how some people manage to sneak on alcohol to drink in the bathroom. There's not much security of that sort at all in northern travel. People seem to wander as they please sometimes. I watched a man walk across the tarmac on his own and board the airplane without showing a boarding pass - and without anyone stopping him. When the flight attendant finally saw him sitting on the plane by himself, she freaked out. "That's...that's...That's actually against the law," she said. The man looked confused. On our way home, they warn us that we'll only be landing in Cambridge Bay "subject to weather". Northerners punctuate their sentences with "weather permitting" almost in the way that some Muslim folks use "Inshallah". On the airplane, I overhear the pilot telling the flight attendants that the weather is still pretty bad in Cambridge Bay, and that we're going to "try to land" twice, and if we keep missing the approach, we're just going to head back to Yellowknife. I'm always up for a surprise extended trip to Yellowknife, but it's a little unnerving to hear a pilot use the words "trying" and "missing". But that's part of northern travel. If you google "plane" and "nunavut", all of the results on the first page are about crashes. I think this is the real reason why I usually sleep through all the takeoffs and landings. My body automatically gets sleepy at these times as a bizarre defence mechanism against the anxiety of facing possible death and not being able to do anything about it. So we try to land, in the midst of the bad weather. What happens when you try to land in fog? You enter a cloud, and all of a sudden you can't see anything about you. Everything is white. There could be a spaceship twenty feet away from your airplane window and you wouldn't know it. Then when you descend below the fog, you see that you are hovering what looks like metres above a frozen ocean. How strong is the ice on that ocean? Then you see the runway ahead, covered in snow and ice. The same ice that I spend a normal part of the day slipping on. That's what this giant metal plane is going to land on. And despite all my fears, we always do. On the bright side, sometimes you get that sweet flight where there are only, like, three other people on the plane. The flight attendant addresses you by name, and gives you a personal safety demonstration. Personal safety demonstration! You feel like a baller, riding around in your private jet. Then she winks at you and says, "Imma sit over there, Gloria. You just holler if you need anything." And there are no screaming babies or drunk unruly passengers or mechanical problems or weather worries and you get a delicious hot dinner for your two hour flight. And then you sleep like a baby for the entire trip. Guys, I went to a rave in a freaking castle made out of snow. I am not making this up. We were enjoying our favourite rosemary drink at the Trapline Lounge in Yellowknife when we ran into a fellow CamBay resident who told us about the Snowking Winter Festival. Actually, he didn't even call it the Snowking Winter Festival, or explain that it's an annual Yellowknife tradition where the benevolent Snowking builds a castle out of snow and ice on the frozen Great Slave Lake for the whole community to enjoy the wonders of winter. "So, there's this rave, and it's in a castle made of snow." I mean, really, you don't need much more explanation than that. We took a cab ride out of downtown and into the darkness. Way out. Keep going. Eventually, somewhere in the midst of the darkness, a mighty castle arose, seemingly out of nowhere, made of snow and funky lights, standing right there on the frozen Great Slave Lake. When I was in high school, I took an outdoor education class where we learned outdoor winter survival skills. We learned how to make a giant pile of snow and then carefully carve out the inside, to create ourselves a warm shelter made of snow. It was a very memorable Canadian experience. I guess this was kind of like that. But on steroids. There was so much detail put into everything. The rooms (multiple rooms!) looked like real, proper rooms. There were lights lined up inside the walls, buried in the snow to light our way. There was a large courtyard with beautiful ice sculptures. There were little tunnels that you could crawl through to get to other rooms, which would be handy in a scenario where the snow enemies are attacking. AND THEY HAD A SLIDE. The castle was even outfitted with washrooms, handy little makeshift outhouses. I was impressed. And of course, there was the main hall, where the rave was going full blast. Like most raves, there was no booze being served, so all the dancers were discreetly drinking from non-coffee liquids from their coffee thermoses. (There was, however, hot chocolate being served, which only seems right in a snow castle). It was an amazing sight, watching a crowd of people dancing in their Canada Goose parkas. And other wild outfits. Girls in onesies. Guys dancing in plaid shirts and overall snow pants. One girl was inexplicably dressed like a dinosaur. It was all so very very Yellowknife, which I've always seen as somewhat of a Portland of the north. And as we danced, little pieces of the castle fell and snowed on me, and it felt like I was being sprinkled with magic. We even got to see the Snowking himself make an appearance too, although I kept mistakenly calling him Santa (and sometimes, Gary). What amuses me about Yellowknife this time of year is the way that everyone always seems so cold, especially tourists. Walking briskly with their hunched shoulders, unnecessary snowpants, scarves masking their whole faces like unhappy ninjas. Meanwhile, those of us passing through town from Nunavut linger outside, bare-headed and our jackets open, waving our arms and loudly exclaiming about how nice it is outside today, to be able to breath in the fresh air without being stabbed in the lungs. You always run into someone from your community here, or someone you know from down south. You also learn, if you are/look Asian, to avoid wearing blue Canada Goose Parkas, which is what all the Japanese tourists on package tours wear here. Otherwise you might be mistaken for one, and be accidentally herded on to a tour bus to Aurora Village. My band played a show at one of the local venues, and we had an amazing turnout. The place was packed, and even some media came to cover the event. It was an open mic event that we were hosting, and we had the chance to see a variety of artistic talents. A local band. Talented young guitarists and singers. A poet/movie enthusiast who conducted a movie trivia with questions in haiku form. An elderly man who sat at the front and played the flute along to whatever you were singing. It was magical. Yellowknife seems to be magical. While I was in Iqaluit, I got to check out the Nunavut Court of Justice. This was pretty cool. A lot of court stuff is done over the phone, or in the communities while on circuit, so a lot of us don't get a chance to actually see THE courthouse. however, the snow acts as a slight access to justice issue. I was there to attend a call to the bar ceremony for some colleagues. That in itself was pretty neat. It was held in chambers, the judge was very welcoming, and the court clerks wore sealskin. Then the incredibly friendly court staff gave us a tour of the courthouse and its various rooms. The place is generally beautifully designed, right down to the smallest details, like the barrier that is shaped like a kamotik (sled), or the smoky glass on the doors to the courtroom, featuring vivid images of Inuit life. The hearing rooms and mediation rooms are also very modern-looking, while incorporating traditional elements. There were also a lot of "Nunavut" elements to it. The security detector, for example, appears not to be used very often. Kind of like the security detectors at the airports in the north. The cells downstairs, which hold the accused until their hearings were a lot bleaker. I imagine most courthouse cells are like that. It's the area that not a lot of people see. Over the cell doors hung a sign that read in all caps EFFECTIVE IMMEDIATELY NO COFFEE AND NO CIGARETTES FOR PRISONERS. While I was in Iqaluit, I also went to see the dentist. This was a big deal for me, because as you remember, about a month ago I had a traumatic dental accident that involved me trying to eat a metal fork. I did not succeed; the fork won. I still had not seen a dentist since the incident, four weeks ago, because a doctor still had not come to Cambridge Bay. Luckily there are dental offices in the big city of Iqaluit, so I finally got to get a dentist to look at my poor traumatized tooth. The dental office I visited had what is probably the most beautiful view a dental patient can ever have while getting their teeth drilled. The office sat on top of the hill, overlooking the rest of downtown and the sunset. In the waiting room sat a young local guy, scarfing down salty chips, I guess ready to make the dentist work for his money. The dentist was super-friendly to me, maybe because I wasn't eating potato chips, and while he stuck his fingers in my mouth he told me stories about hanging out with Harrison Ford and Bono and Queen Latifah, who is a very good friend of his. I asked him that if my tooth needed to be replaced, can I get a gold tooth with grills? He laughed and then abruptly said NO. Apparently patients have asked him that before.